I saw a really cool looking stamp for Haloween that I really wanted but couldn't afford at the time. 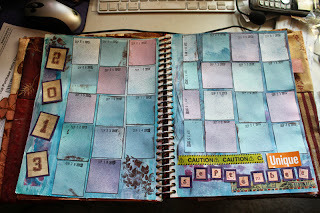 The stamp is called the Pinup Queen, and I saw it really well used on the Kathryn Wheel blog. I also wanted to use this image in a painting in a much larger size so I decided to see if I could render my own version of this image in a painting. Drawing freehand is difficult for me, and the human form is challenging for me to render exactly. I used an old canvas with a painting that really didn't come out well. and started with a base of white gesso, and then proceeded to add arcylic paint, alcohol inks, stamps, and acrylic silk glazes. 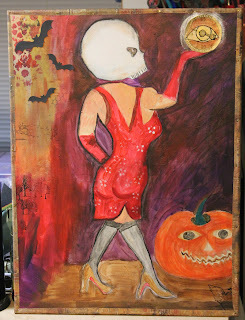 My painting is 2 feet by 18" in size and I put her in a short dress of my own design. I like the bootilicious look. 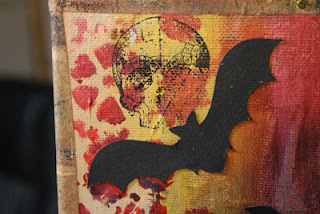 I also liked adding a distressed edge to sides of the painting. I cut strips of paper, which I secured with old brass nails and glue. It just really has a put together look that I'm going to complement with some other haloween crafts that I'm making for the front foyer. I wanted to try my hand on a calendar page in my art journal for the month of September which has been a rainy month in deed. 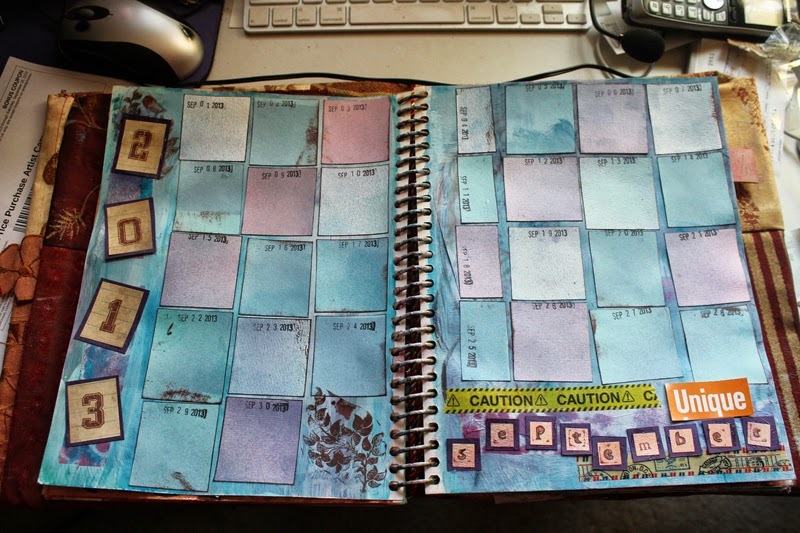 It has a lot of colors that I would associate with spring which is what this rainy September reminds me of, but I've used some fall color too like the purple and orange, and brown stamps. Six or seven years ago, Steve and I went to Honduras to see my brother who was there for a Peace Corp assignment. While we were there, we backpacked and then took a dugout canoe to an isolate village where Tony often visited to help with economic sustainment activities. 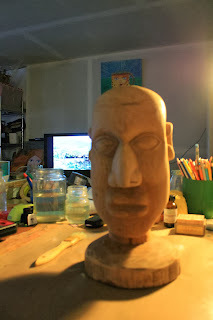 There we met a carver who made these wooden heads. We bought one and stuffed in my backpack and took it home and I put in on my dresser and there it stayed all this time until last month when I decided to paint it. I was tired of staring at his plain wooden face. 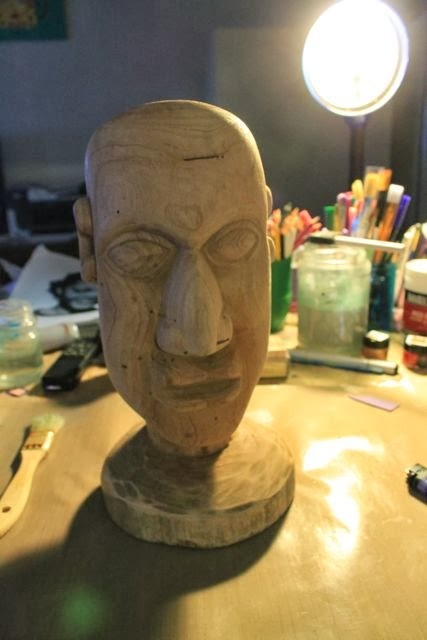 I wanted to bring some life to his vacant wooden appearance. 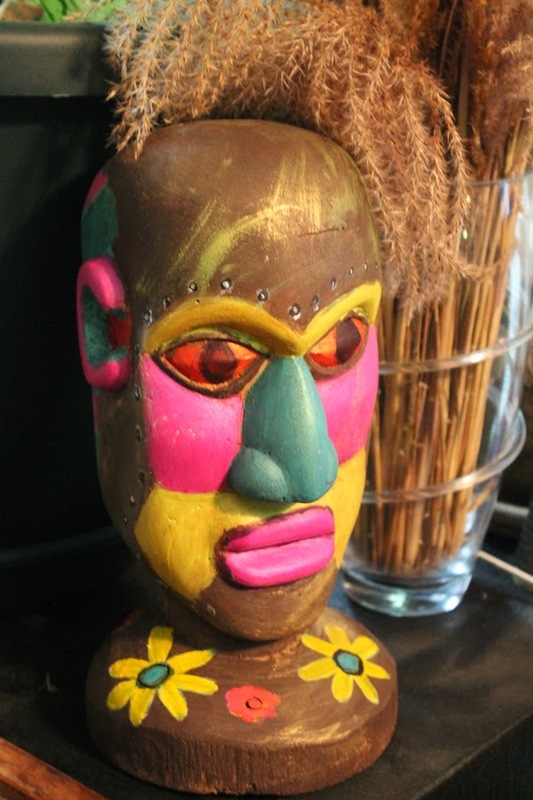 After a few weeks of working on him, there he joined the other masks and ethnic souvenirs that we've collected over the years. We have like one wall where we display our collection.